without having to have a hardware controller. Great for testing and experimenting. Great for playing around, testing complex MIDI setups, and learning more about MIDI when you’re away and don’t have extra hardware. How do I make it do stuff? Select a the kind of message you want to send with the tabs at the top. Press the Note buttons, or drag the value sliders. I’d love to hear your questions, feedback, and how you’re using MIDI Friend. I’ve also got a press pack available for download, with the MIDI friend icon and a bunch of screenshots you can use. You might like to check out my other app, DMX Assistant, which can output DMX Art-Net triggered by MIDI. MIDI Friend will only send messages to the destination device selected at the bottom of the window, on the selected channel. Make sure it’s correct. What exactly does it output? 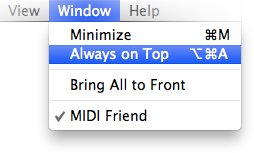 MIDI Friend has a simple interface so it’s clear exactly what it’s doing, and can even be told to stay on top of other apps you have running so it’s always accessible (the option is in the Window menu).